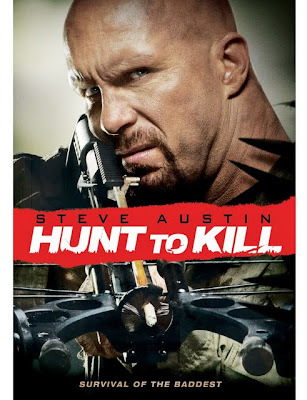 Hunt to Kill proves to be a much better fit for the evolving cinematic range of professional wrestler turned movie action hero “Stone Cold” Steve Austin than 2010's previous direct-to-disc B-movie The Stranger , which was a little too ambitious for its own good. Within the first act we realize that The Keeper director Keoni Waxman's surprisingly entertaining Hunt seems tailor-made for the emerging star. The work reunites Austin with Damage screenwriter Frank Hannah and the same production team behind Stranger and Damage as well as co-stars Eric Roberts (in a brief cameo) and Gary Daniels from Austin's big screen summer blockbuster The Expendables . Hunt to Kill utilizes the tried and true wilderness variation on the hostage movie plot we've seen in a wide range of films including the superior '90s blockbusters The River Wild with Meryl Streep and Kevin Bacon and Cliffhanger starring Expendables mastermind Sylvester Stallone. And while it's nothing we haven't experienced before, when pared down to its essence, we realize just how efficient and effective this set-up can be in a low-budget action picture. After a rather pointless opening sequence that never really pays off effectively later on aside from the introduction of a key prop that we know we'll encounter once again, Austin embraces his inner Rambo and Commando as U.S. Border Patrol agent Jim Rhodes. When a ruthless band of criminals set out to track down the loot that's still in the hands of the leader who'd double crossed them crosses paths with Rhodes, the dangerous and desperate thieves take his rebellious teenage daughter Kim (Marie Avgeropoulos) hostage, forcing him to serve as their guide. When an escape attempt goes awry as Rhodes tries to create a diversion that would allow Kim to flee into the woods she fortunately knows as well as her old man, the Border Patrol agent has no choice but to aspire to remain one mental step ahead of the crew, headed up by actor Gil Bellows' increasingly unstable Banks. A student of The Jack Nicholson School for Overacting Villains, the gleefully eager Bellows swings for the hills, chewing more scenery than a creature in the wild, thereby making some of Hannah's scripted quips sound as demented as cliched comic book bad guy speak, attacking certain words Christopher Walken style for unusual emphasis, yelling in people's faces and genuinely having a blast being a baddie. The result makes the mostly monosyllabic Austin seem even more Zen in his minimalist, soft-spoken Seagal-esque demeanor. Needless to say and for better or worse, since it's both entertaining as well as distracting, Bellows easily dominates the rest of the cast. Yet once Austin's Rhodes moves from mere mental to actual physical steps ahead of the rest of the gang and begins starting to pick off the bad guys one by one, it becomes clear that the fights have usurped language. Namely each encounter incorporate different battle techniques, allowing each actor to shine and ultimately convey in a visceral way far more about what's at stake than a screamed threat. Despite the elaborately staged brawls, you're easily able to predict which characters will be the last ones standing. As such, the film's final ten minutes repeatedly abandon all hope of logic and rational thought for simple thrills as Rhodes must continually “kill” one annoying villain who just won't stay dead to the point where the situation becomes unintentionally funnier than a bad horror movie ending cliché. Nonetheless, while it's refreshing that one legitimately dead character from the start doesn't just walk back into the movie in the last half as I was expecting given the typecasting involved with regard to the actor portraying him, when you look past the film's uneven structural issues like the lame exposition heavy opener, Hunt to Kill is far more enjoyable than you might've imagined it would be. Likewise, it's another step in the right direction for Steve Austin who seems to be getting more comfortable expressing emotion and complex thinking while in front of the camera. And although it's a predictable B-movie all the way, it's a thoroughly engrossing one that is sure to satisfy fans of both Stone Cold and old school action looking for a two hour rainy Saturday afternoon matinee escape.